This post was gladly contributed by Kathy Matthews. We bought a lot of food and brought it home. Then I needed to figure out what to do with it all. 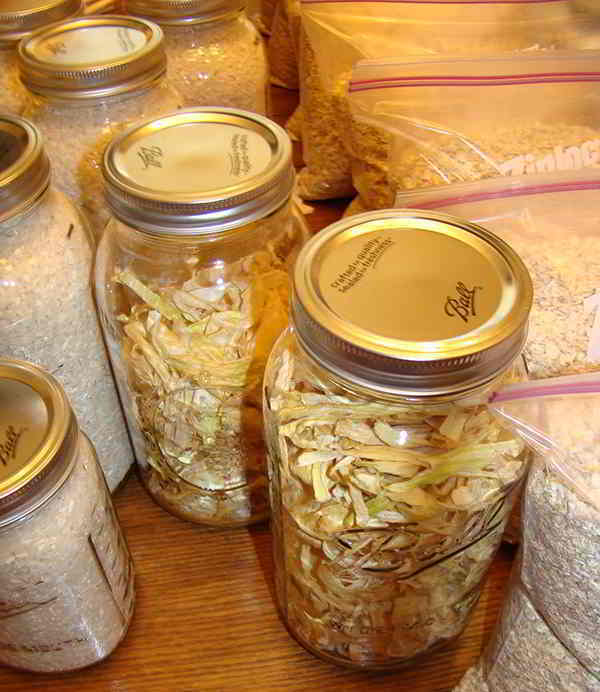 The dry foods are the easiest to figure out, if you have a lot of canning jars or other good airtight containers that mice or bugs cannot get into. I have been planning on canning, but that is still a bit intimidating for some reason. Still, I am good at buying canning jars. Bi-Mart keeps them in stock year round now, so I try to pick up a box full of one size or another every week or couple of weeks, especially when they are on sale. The average price is $8.99; sometimes less and sometimes more. I am partial to the quart jars because I like to use them for my cookie mixes, but have been buying other sizes too. If I do want to use all of these jars for canning, I’ll just dump out the popcorn and rice and put them into something else. Even big Rubbermaid totes will do fine, if you have the room for those. The food on this table (not counting the containers) was only $82.83. Fifty pounds of popcorn. You may be asking me why I would want to buy so much. Well, the bag was only $20.89 (or .42 lb) at Cash and Carry, I love popcorn, and it will keep well. I am thinking of selling the smaller jars after decorating them with fabric and raffia with a matching gift bag in my little store. Here is fifty pounds of rice ($17.99, or .36 lb) and fifty pounds of onions ($11.25, or .23 lb). There were really 17 more onions, but we used one and I dehydrated the other 16. These two jars contain 16 dehydrated good sized onions. Pretty cool, huh? Our house smelled like onions for a day, but that was okay. I put the 25 pounds of quick oatmeal into Ziplock freezer bags, because I have room for them and will be using them in my cookie mixes. At Cash and Carry, it cost me $15.00 for 25 pounds (.72 lb). The 25 pounds of sugar cost me $17.62 (.72 lb). I put most of it into old spaghetti sauce jars. I also bought 50 pounds of flour for 16.09 (.32), but I left it in a Rubbermaid tote in the garage for now. I also bought 5 dozen eggs for $6.00 (.10 each). I boiled up 4 dozen, and we made egg salad and pickeled eggs. The pickled eggs will last for a couple of weeks in the fridge. I just put pickle juice over the eggs … beet juice works well too. I have a bunch more food in the fridge that I need to deal with, and my freezer is full so I have to figure out something else to do with it. I think that I will dehydrate some broccoli and green onions, and more of yellow onions. 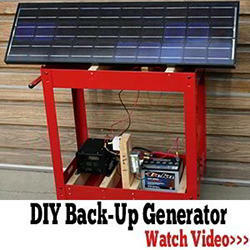 Though buying this way is less expensive, it does take a lot more time to make things convenient, but the work is easy. Best of luck! I’d love to hear about how you guys do this sort of thing, so please leave me a comment or an email if you want to. This article was written by Kathy Matthews and first appeared on Oregon Gifts of Comfort and Joy. Canning is great and takes up less space as you discovered with your onions. Onions and apples dehydrate and are great keepers in canning jars – but I recommend getting a lid sealer. I use my food saver attachment. Broccoli will not dehydrate well. It does freeze dry very well, but you would have to buy a freeze dryer for home use and that is expensive. Dehydrators are less expensive, but can’t produce a good product in a lot of food. Canning is so rewarding, but does take time and makes a lot of heat. It sounds like you have the bug and that is great, but time and being creative are the next steps. I have the Ball Blue Bell book of preserving and the Excalibur book on dehydrating that came with the dehydrator. It also pays to grow your own, you can do that year round with different methods. I have a beautiful celery growing right now that I started from the bottom of a grocery store stalk. Once you have little roots, you can plant it. Celery dries good too for soups and putting in other dishes and it dries to almost nothing so little space. One hint on canning jars, which I too love, is that light can get in them. So, more delicate food (like apples or celery) should be place in a dark cool place with no sun on them. The Mylar bags (yes, expensive) do a great job of keeping light out for Freeze Dried food and probably dried (haven’t tried dehydrated food yet in them). One little trick I learned years ago was to use an old sock or shirt sleeve over the quart canning jars to keep sunlight out. Of course, mark the tops so you know what’s in them and check them on a regular basis. Chele – thanks for sharing this tip! I would never have thought of this, but it’s a wonderful way to re-purpose those worn out socks! Find a friendly restaurant that will give you food grade 5gal buckets, bleach water will remove the smell of pickles and other undesirables. Buy bags to double line the buckets and start filling with sugar, salt, rice, pasta, assorted flours and dried foods. Use your imagination the wife and I have been prepping 30 years and with a 60×80 ft garden we keep 100 qts canned top crop, 100qts of stewed tomatoes, 48tp 60pts of salsa many frozen stuffed bell peppers, large banana peppers stuffed and wrapped in bacon. Breaded sliced okra and zucchini. We also have a red raspberries patch and will add a BlackBerry patch this season. In the fall and winter we take harvested deer and make deer stew and chili can it with a pressure cooker canner and shelve it. Trips to the meat packing plant produces chickens for home made chicken noodle soup and or stew. I have just discovered a way of canning cheese potatoes soup by blanching the potatoes after the soup cooks up and canning g the mix so the potatoes do t break down. Then their is can ed pickles gal, half gal, qts and pts of whole sliced and spears. Take banana peppers core slice and using a sweet pickle brine can them with a single hot pepper. Let your imagination run wild and you and wife or canning friends knock out some great wines in the process. The article was great and extra comment from Ms. Bly answered the rest of my questions! Great teamwork! What do you mean by a lid sealer? It’s an attachment that goes to the Food Saver vacuum sealer for vacuum sealing canning jars when you’re using them for storage instead of canning. It can probably be used with other vacuum sealer too but I’m most familiar with the Food Saver brand. I use them as an extra layer of protection. They help to insure there is no oxygen in the jars to degrade what is stored in them. Vacuum sealers may be good at removing the air from jars but they cannot create a true hard vacuum. There will still be some stray atoms of O2, sometimes out of the food itself. That’s where the O2 absorbers come in. However, I do not use O2 absorbers for everything vacuum sealed. I buy in bulk where I can. I’ll break the bulk package down into smaller, more manageable units. Knowing I’m going to be using what is in the jar within six months to a year or so, I don’t use one. If that jar is going into longer storage, then the O2 absorber goes in. We package our rice and beans in jars and put in oxygen absorbers and then put the lids on. As the absorbers work it seals the lids down. A great article! Funny — I was just thinking this morning that it would be helpful and interesting to know how others are storing their food, and here you are! You can dry can a lot of things (NOT popcorn because you need the moisture in it) like flour, rice ect. 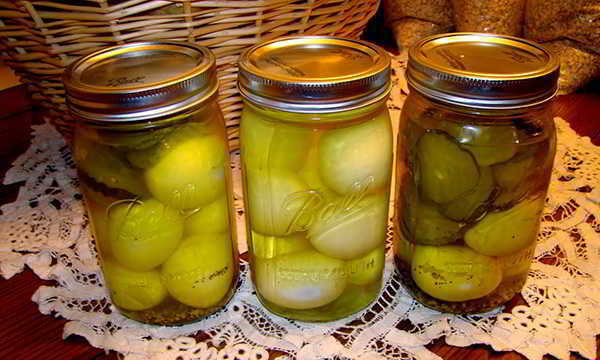 Dry canning kills the eggs that could hatch into bugs in your larder. I have no moths or worms after several years in the jars. Fill jar (no headspace needed). Place full jars on sheets with edge to help prevent spills. Place sheets into oven on low rack. Shut door. Set oven to 200 degrees. One hour. Remove jar. Damp rim with cloth or paper towel. Quickly screw on cap and band. As the jars cool, they will seal. If one doesn’t, use it first. I do cereal and pretzels. Thanks, hippie60. Great idea. I will do this, too. I just got a range and it had directions for dry dinning and dehydrating in the manual. many have success but it is not recommended by mason jar manufacturers as your jar can break or get tiny cracks in the glass from this method. 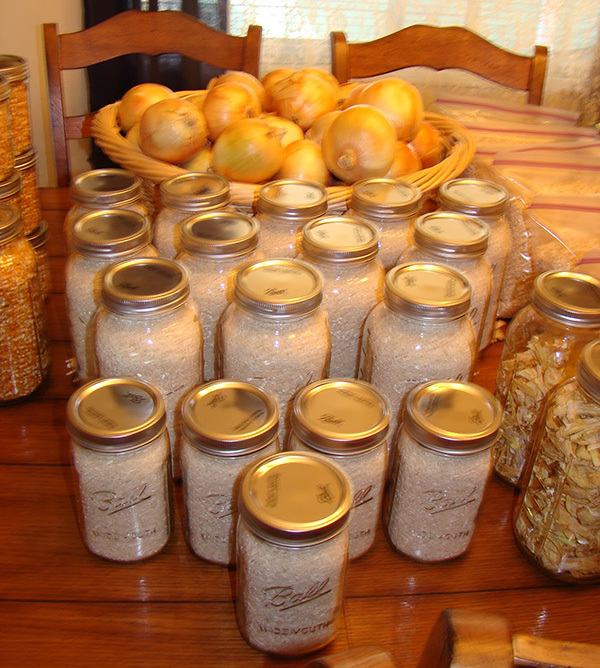 hippie60 – I’ve also had good results dry canning crackers, oatmeal, flour, and ground coffee. If I end up with some stale bread, I put it in the dehydrator to make croutons and / or breadcrumbs, then seal them by oven canning. Canning is not difficult and shouldn’t be intimidating. I would recommend a really good pressure canner, like All American, and it can be used as a water bath canner. There is so little recommended for water bath canning these days. I use my water bath canner mostly for sterilizing jars and for making turkey or chicken broths. While I haven’t tried it yet, I heard that popcorn can be ground into corn meal thereby giving two products with the purchase of one. I haven’t tried it because all my popcorn is nitrogen-packed and I don’t want to open it just yet. I don’t know what I would do without a vacuum sealer. Buying in bulk and then vacuum sealing is one of the best ways of storing food stuffs anyone can use. Another way to vacuum seal canning jars of dry foods is with O2 absorbers. Simply fill the jars and prepare the lids as if regular canning. Quickly stick in an O2 absorber and place on the lid and ring. As the O2 is absorbed, the jar will vacuum seal itself. 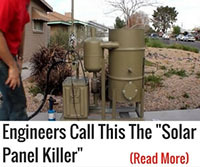 You have to work quickly with the O2 absorbers. It’s best if you have another person helping. Those little packets can’t be left in the open air very long or they quit working. I have a vintage cracker tin that has o2 in the lid. It says to put the lid in the oven until the pellets turn back blue. With moisture they absorbed it turns the pellets pink. So I believe you can reuse the 02 if you put them in the oven on low for a period of time. Just a thought. That’s sounds more like a moisture absorber than an O2 one. I’ve had moisture absorbers like that that turn pink when full and blue when dry. All the O2 absorbers I used over the last 10 to 15 years are one-use only and have to be kept in a vacuum-sealed container when not in use or they become useless. Popcorn can be ground into grits for porridge or to make fried mush, or into flour for making cornbread or pancakes. If your stored popcorn doesn’t pop well after you’ve had it for a while, rehydrate it by sprinkling it with a small amount of water, drain and pat dry before popping. You won’t get as many unpopped kernals. If you rub each “fresh” egg with mineral oil, they will last up to 9 months! Will this work w olive or coconut oil? 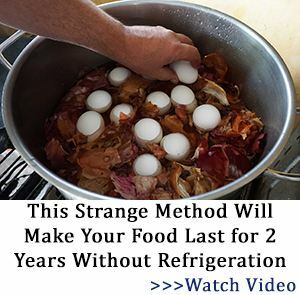 Well from what I’ve read you can submerge your eggs in mineral oil and place them directly on a shelf in a root cellar. I have heard that once you’ve don’t this to your eggs they can last over two years! So no need to hard boil or refrigerate or can as long as you cook them in less than two years! Somewhat true, eggs from chickens in your backyard are naturally coated and can last ages if you dont rinse them off. However eggs from the grocery store have been washed and need to be coated before storing. A diet heavy in corn can lead to pellagra. Pellagra is a vitamin deficiency pathology with some very serious symptoms. Pellagra was common in the southern states in the 19th century and the early years of the 20th century. Many prospective draftees from the south failed their induction physicals due to symptoms of pellagra which include mental deficiency. A diet heavy in white rice can lead to beriberi. As late as the mid 1800s a high member of the Tokugawa clan died of beriberi because he loved white rice so much that was his diet almost to the exclusion of other types of food. Although the Japanese knew that a diet of white rice led to beriberi, his position was so high that no one dared contradict him when he demanded a white rice diet. I always wondered why the Mexican diet consisted of beans and rice at the same meal. Talk about carb loading! I thought that might be contributing to their problem with overweight. Wrong, Cricket. While it may indeed contribute to the overweight problem, the fact is that in combination with rice, the protein locked in beans is released and in enough quantity to meet your daily requirements for protein. The same with corn. If it is treated with lye, a process called nathualizing, don’t trust me on the spelling — it releases the niacin in the corn which combats pellagra. The ancient indians used that to process the corn and they didn’t suffer from pellagra. When the white folks decided to make corn a staple in their diet they got pellagra because they didn’t treat the corn with lye — at least that’s what Wikipedia says if you look up pellagra. While we’re talking mainly about corn and rice, it’s not all we will be eating. 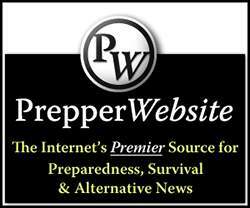 Most preppers have the ability to garden, or have family or neighbors who garden, and will have fresh vegetables, meat from hunting or raising their own, and some have fruit trees and berry bushes. I get the feeling from your posting that you believe all we’ll be eating will be corn and rice. Am I wrong? Both of the disease entities I mentioned can occur as a result of a diet heavy in those two items. As I indicated many draftees in WWII from the south suffered from pellagra although meat from hunting small game and consumption of other foods was common.It was common to have grits for breakfast (made from corn); hush puppies or corn dodgers for lunch and the same for dinner with squirrel, possum or rabbit. For Japanese the main dish for each meal is rice. Everything else is considered side dishes. For older Japanese if one hasn’t eaten rice, it is not a meal, it is just a snack. Since WWII, the diet of Japan as broadened significantly. I might add that one of the bigger hamburger chains in Japan is Mossburger (They do like unique names) and the “bun” is compressed rice cakes. I don’t know which is larger in number of locations, MacDondald’s or Mossburger, but I suspect it is Mossburger. Thanks for the information. I’ve been researching beriberi and pellagra since your posting. Interesting stuff. While we have a lot of rice and corn stored, it’s not an everyday or even every week item for consumption in this household. A 5-pound bag of grits lasts us nearly two years. I’m also looking at the stores as possible barter items in an SHTF situation where trading becomes the norm. Hopefully, it won’t happen but these days, you never know. Are you sure that in every emergency possible you will be able to garden? Raise animals? Do you think with everyone hunting that there is no possibility of killing off all the animals in the area? It just might not be a weekend emergency you find yourself in. We have a garden every year. We’re not waiting until SHTF happens to start. That would be too late. We harvest about 3/4 of what we grow and let the rest go to seed so we have seeds for next year’s garden. The harvest is either canned, frozen, or dehydrated. As for meat, we have a lot of neighbors who are raising animals but no garden. We’ve already been talking with some about trading vegetables for meat. Hunting is another subject. The terrain around us is rough and mountainous, and most of it is privately owned. Plus, we are far enough from a city to not to have to worry too much about them bothering us. Yes, I know that if/when something happens, it will probably be long term. Having a garden will make that time a little easier to endure. I don’t remember if I mentioned it in an earlier post, but raising quail as a meat source is good. They mature at about 8 weeks and start laying eggs. They are small so you don’t have a lot of waste if there is no refrigeration for leftovers. One of the biggest problem I have read is that they don’t hatch their own eggs so you would need to figure out some type of incubation system – but if you also have chickens and have a broody hen that takes care of that. Would be worth looking into more. That’s right! We can NOT expect life to go on as before! There will be a LOT of DISrespectful, NON-law-abiding IMMIGRANTS coming through taking forcefully what we HAVE, and even taking over our HOMES and forcing us OUT!!! There will be a lot of disrespectful, non-law-abiding CITIZENS, too. Come on, think about it. If Bubba wants what you got, he’ll come and take it. which is wise to have weapons, to protect whats yours, or get what you need if you didnt prep from those who did, illegal or citizen…..
On a similar note, I’ve also heard the rice-eating southern Italians refer disparagingly to the polenta (cornmeal)-eating northern Italians as “polentoni.” In addition to referring to the diet heavy in corn, there is an implied reference is to the lower intelligence as a result of pellagra, caused by a missing or non-absorption of B vitamins, niacin, or tryptophan, an amino acid required for its synthesis. It is a common disease among people who depended almost exclusively on corn. So if we have to depend on corn, we had better be sure to get the B vitamins from supplements if we don’t have access to vegetables and dairy. Good to know! Thank you! My daughter, Dr. Rhonda, has been encouraging us to get off corn! I would just like to make a point, about what you said about “getting off corn”. And that is, about 95% of all corn grown in the US, is GMO (Genetically Modified Organism). Almost everything in the grocery store has “high fructose CORN syrup” in it, even your loaf of bread. This “syrup” goes by a lot of different names, so I would put that term in your browser’s search box, and study up on it. Also learn all you can on GMO. Corn is not the only GMO crop, here in the US. What can we do about avoiding GMO food and drinks? Eat and drink as much organics as you can! You’ll find your health changing for the better, as all factory farmed animals, are given antibiotic and hormone shots, and eat GMO grain (corn). This all goes into YOU! So your milk, butter, eggs, hamburger, pork chops, etc, are ruining your body.Your fruits and vegetables must be organic, because the regular ones, are sprayed with many chemicals, herbicides, and pesticides. I do hope you’ll study up on GMO’s…and turn toward organics….it’ll turn your life around for the better! Joanofark06’s comments regarding GMOs reminded me to share with you that research from universities and private entities have been been using a method called “chemical mutation” to alter the genetics of grains such as wheat. It appears to me to accomplish the same results as GMO research; however, modern wheats, while not technically a product of GMO research, are definitely a result “chemical mutation” which is a gene altering method of pushing for certain desired results. The overall goal is to produce grains for high yields, increased protein content, resistance to weed spray to keep weeds out of the crop, greater resistance to hail damage and pests, etc. I only mention this because it helps preppers to realize that genetic alterations are far more prevalent in out food supply than most people realize. The only grains that remain free of genetic modifications, other than some attempted cross-breeding, are the ancient grains like Spelt, Kamut, etc. These grains do not contain enought gluten to make a light bread, but will still serve as a good food supply. I use Kamut to make a “wheat berry” cereal and to add to a special “survival soup”. For the name “Kamut” to be used means that it has to be grown organically. A dear friend and college fraternity brother developed this brand of wheat that was brought back to the U.S. after WWII in a quart jar. He now has it growing worldwide. It came from the middle east. hippie60- how long should rice last in sealed jars using the oven technique you describe? Where I learned to do it, the source said she opened jars her grandmother had canned around 50 years old. She said it was still good. Personally. I would date the lid and rotate old to front. You got a bargain on food but not much nutrition; popcorn, sugar, onions. I’ve stored 25 pound bags of rice, beans, flour, and sugar for up to 5 years in the bags that they originally came in, on shelves in the basement and never had a problem with rodents, bugs, or mold. To be fair we live in very dry climate so things may keep longer here. If you want to store dried garlic, herbs, onions, peppers, and tomatoes, grow your own. They are easy to grow, easy to dehydrate, and cost virtually nothing for seeds. There are many ways to get the seed for free. Pickled eggs in the fridge last way longer than a few weeks. I use the giant pickle jars, they hold about 3 dozen eggs. I pickled them about 3 years ago and am still eating them. One thing I have learned to do is can ground beef. I use to brown it and then stick it in the freezer, but still had to wait for it to thaw before I could use it. Now I brown it, drain off the grease, pack it into pint canning jars and pressure can. A pint jar holds about a pound of meat and it is ready for whatever I need to use it for. I’ve can’t say for sure how long it will keep on the shelf as I tend to use it during hard times. (Our hours at work have been cut now for over a year and no other good job opportunities in our area.) I have opened jars that were 3 years old, and it was fine. I do the same with ground pork and/or sausage. I, too, can ground beef, as well as beef chunks and boneless chicken breasts, except I pour beef or chicken broth over the meat before canning. Does your ground beef stay moist when canning without any liquid? What ratio of ground beef do you use? I usually use a 93/7 because I can get it in 10 lbs logs. Most of the time, I just pour some hot water over the browned ground beef in the jars. I have gotten in a hurry and missed a couple jars, and it still worked out fine. I think the ratio I usually get is the 73/27, but when I can find ground chuck on sale I mix the two together and do it that way. During the holidays, I also debone the leftover turkey and can that to be used in casseroles, turkey salad or whatever. I then put the carcus in a crockpot add veggies,cover with water and let it slow cook overnight. I then strain it and have some wonderful homemade broth. I’ll have to try the 73/27. 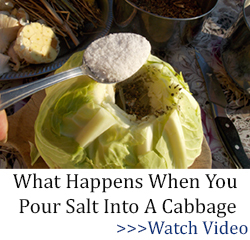 With the higher fat content, it retains more moisture. When I’m going to can the ground beef, I use the beef logs from Sam’s. After processing/canning, it’s hard to tell where it came from. I think Sam’s sells 73/27 so I’ll have to get some to try it. Most of the time, I buy meats from local sources who raise their own for slaughter. Grass-fed, no antibiotics and without the high price demanded in grocery stores for such meat. I do that same thing with a turkey carcass. I put up six quarts of broth a few weeks ago. I used the meat that had been left on the bird after deboning for dog food. My dog loves turkey with sweet potatoes and vegetables. Love all the info. Keep comments coming please. It is a wonderful feeling to go into pantry and get food put up six months ago (or longer) and cost was that long ago. Saves in the long run. For many stored foods, the return on investment certainly exceeds anything you can get at any financial institution. The rice that you bought three years ago and put away is now up 12 to 15%. Apples used to be 29¢ a pound on sale not so many years ago. How long has it been since you saw apples at 29¢ a pound. Now on sale at our local markets they are $1.29 a pound. But the government says inflation is remarkably low. StarKist chunk tuna only 3 years ago was 39¢ a can on sale. Now it is 69¢ a can on sale. That’s almost double. If I had put the money in my local federal credit union I would have less money in the account than I started with because they charge you $5.00 a year non-activity fee and the interest they pay is so low unless you have a real chunk of money in the account the interest you earn doesn’t come to $5.00. I solved that. I invested in tuna fish—well, not the whole amount in tuna fish. I don’t like it that much. Why pickle the eggs. They’ll keep two months or more on the counter. Only if your hens laid them. The store eggs are washed and don’t keep as well as eggs from your birds. It’s just me and my dogs, how much food would I need? If I were you, I would store at least a year’s worth for myself and the dogs, and maybe a little extra to use for bartering. I won’t give away my food or ammo. I put away things to barter. Tools and what have you. You can buy tools and such at the dollar store that will be worth their weight in gold if the SHTF. We put some cheap whiskey in pint bottles away too! 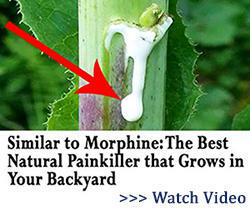 It can always be used medicinally if nothing else. I grow a ton of Cherokee Purple tomatoes. Instead of canning them we now dehydrate them. Much easier and takes up much less space. All you have to do to use them is soak them in water and you have ALL the flavor back. Our best investment was our dehydrator. I’ll have to try dehydrating the tomatoes. Thanks for the tip on soaking them in water. Ever had sun dried tomatoes? That’s the big yuppie food on the left coast right now. How do you store them once dehydrated? For anyone putting canning jars on shelves I HIGHLY recommend putting a bar of some type 4 inches above the shelf on the outside edge so that your jars will not fall off during an earthquake. 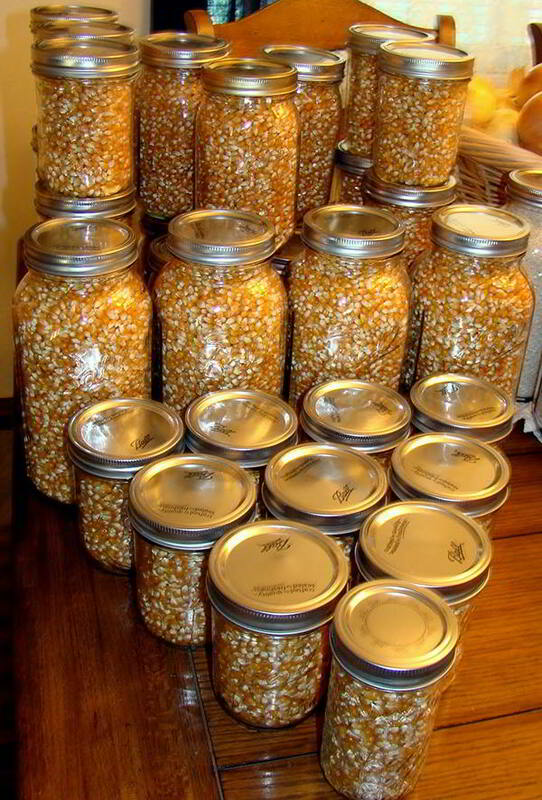 I did this in Idaho and saved over 300 jars of canning jars where other people lost everything! I even put canned jars on the floor level. We don’t have earthquakes here (at least not yet) but I do have edging on my shelves. Better safe than sorry. Good hint! Even NYC can get earthquakes and its got a granite bedrock. The day we moved to AZ from California we had an earthquake here. I’ve finally decided the only earthquake free zone is in an airplane. “…the only earthquake free zone is in an airplane.” Isn’t that the truth! When I lived in Alaska, my house was one block from the fault line that tore the city up in 1964. Then I lived in the Midwest for many years. I moved from the New Madrid Zone years ago to an area not known for earthquakes. In the ten years I’ve been here, we’ve had at least 3 good shakers and several others small ones. Imagine my surprise when I found out that an ancient, but still active, fault runs the length of the main highway in the area. Really…!! In the town I left in Calif. there was an earthen dam 30 miles east of us. It was built across a fault line. They had to strengthen it because if it broke during ‘The Big One’ out entire town would be under water. Our town was also sitting on a fault line. I remember the Alaska quake…but there is little on youtube about it. 6 minute segments but that’s about it. Any film footage was 8mm home movies….and snapshots…. I saw once where a lady took old socks and cut the foot part off and then slid the upper part down over her canning jars. This kept the jars from hitting together and cracking. Of course in case of an earthquake it might not help too much. I put flour and sugar in quart canning jars. I also take Spaghetti noodles and other noodles and put them in Quart jars. I insert moisture absorbers and oxygen absorbers and the jars seal. Using oxygen absorbers many bulk goods can be dry canned.That way they last a long time. I can around 95-110 jars of fruit, vegetables, soups, and jellies per year, eating around 2/3 of them during the rest of the year. The other third goes into long term storage. We also dry mixed fruit and various herbs/spices and store them in mylar bags. I get people to save their jars for me and get some at yard sales and from friends, so I do not purchase more than one box of jars per year. Where to you get oxygen or moisture absorbers? I get mine from the LDS. You don’t have to be Mormon to order preparedness items from their website. Here’s the link: https://store.lds.org/webapp/wcs/stores/servlet/Product3_715839595_10557_3074457345616706370_-1__195877 There are other places that carry them as well but I found the LDS had the best price. Kathy, I tried to put together a 7 day supply of non-perishable food for a family of 4 (2adults, 2 kids) for under $120.00. The problem I found was that there wasn’t enough calories. Even though we tested amounts (serving size) and taste,most was purchased at Walmart (one requirement was that you needed to be able to obtain similar prices around the country at a national chain.) The problem was that there wasn’t enough calories. Our filling meals only averaged 738 calories and, according to our nutritionist, we needed at least 1100 calories to survive in a healthy way. Keeping in our price range and still providing people with 3 meals a day and at least 1100 calories was almost impossible. Bob, I wonder about your figures. I am not a nutritionist, but I have done a fair amount of reading on the topic of daily caloric intake requirements. 1100 calories a day seems awfully low to me. The reading I have done indicates that a male(the mythical 150 pound male) between ages 25 and 45 needs 2500 calories per day with the mythical moderate activity. I know that c-rations which were designed for highly active men between 18 and 25 ran 3600 to 4000 calories a day assuming that one ate everything in the box. I have read that MREs run about the same, again, eating everything in the package. Your diet must have been extremely low in fats and carbohydrates to only reach 750± calories a day. I just finished reading a book written by an army officer who led troops on the plains in the 1850s. In one trip he talks about them running out of food and having to eat their mules which were so skinny that the men were enervated by the lack of fat in their diet. In another book by women crossing the plains in the great migration to the left coast they also talk about the lack of fat in their diet due to it being heavy on grains and low on fat meat. It is my personal belief unsupported by any evidence that the reason why most vegans look like they may have been recent guests of the two recreational systems that I mentioned in the previous paragraph is that they just don’t have enough fat in their diet. Now, I realize that the only general rule is that there is no general rule, so I don’t need to hear about somebody’s Uncle Billy who is a life-long vegan and tips the scales at 240# and is noted around the county for his ability to pick up a yearling steer all by hisself and able to out pull a pair of Belgium draft horses in the stone sled pull. Make sure you are getting enough fat in your diet. If your diet is mostly grains and dried veggies, yeah, you definitely aren’t getting enough fat which you will need to maintain energy and body mass. Consider canned fish, canned meats, dried meats. Cheeses will keep the specified period without refrigeration. I understand Velveeta has a shelf life of 500 years. Why the $120 limit on the budget? If it is food to sustain you in an emergency, money should be the last consideration. I can understand the portability. If you have to travel for two weeks you don’t want it so heavy you can’t move it. However, with two adults, it seems to me a fair consideration that the load can be split, perhaps not equally but 60-40 on two two-wheeled conveyances. If you use two wheeled luggage dollies, two adults can haul about 250 pounds on two light weight dollies. Bob: If you are already getting fats from meats in your food supply, you might try adding olive oil to your meals. Olive oil is rich in unsaturated fat and will add calories and fat to your diet. It doesn’t go bad easily, and if it does go rancid, you can always burn it in an oil lamp for right. Great comments. I’m 58-years old male who remembers my mom pressure canning as a kid. I bought a 17-qt American canner, last year I canned beans, bean with bacon soup, beef stew, split pea w ham (yum) much better than any ever had, chilli. Also hot water bathed pickled beets (yum) and did a bunch of refrigerator pickles. I also brew own beer so I do canning in garage so house does not get hot on brew burner. Only takes about one pound of propane to pressure can 17-qts. Once have canner and jars very economical. I can what I like and next year start over. 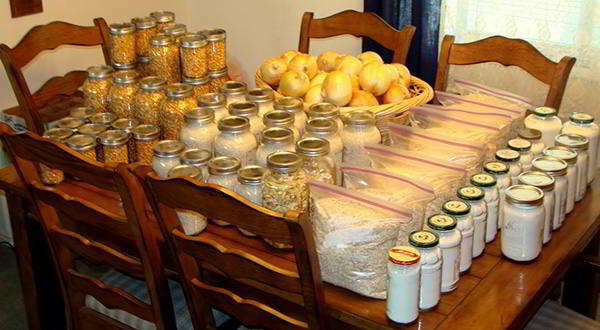 SHTF folks hoard mason jars and lids. Also if you have jars lids canner and propane burner, if you have EMP you can can your freezer meats like hamburger, steak, roasts, sausage, etc, rather than watch it spoil. You got that right about hoarding canning jars, etc. About two or three years before I had to retire, I purchased nearly a pallet full of canning jars (not all at once). People laughed but I didn’t care. Now I have jars, jars and more jars, plus lots of extra lids and don’t have to spend my limited retirement funds on such things. I spent my last few years of working acquiring some really good equipment too. 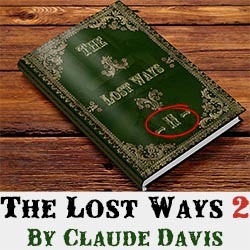 My SHTF event happened when I had to retire long before I wanted to due to health problems. Excellent article, I would never have thought of recycling pickled juice, but that is probably because my ex-wife was so highly allergic to beets that even eating a piece of store bought blackberry pie meant instant need for ‘diphenhydramine’ (generic Benadryl) to treat anaphylaxis because when they state natural food coloring agents added, they mean powdered black berries. One pickling agent we preferred was the bring from green olives stuffed with pimento. We saved it throughout the year for pickling eggs when we had surplus in the spring. We put them in 1/2 gallon jars and kept refrigerated, we never kept them long enough to know their shelf life, but I wsuspect they can be water bath canned and significantly extend their shelf life. If some of you readers have a recipe for making green olive brine, I would appreciate it. 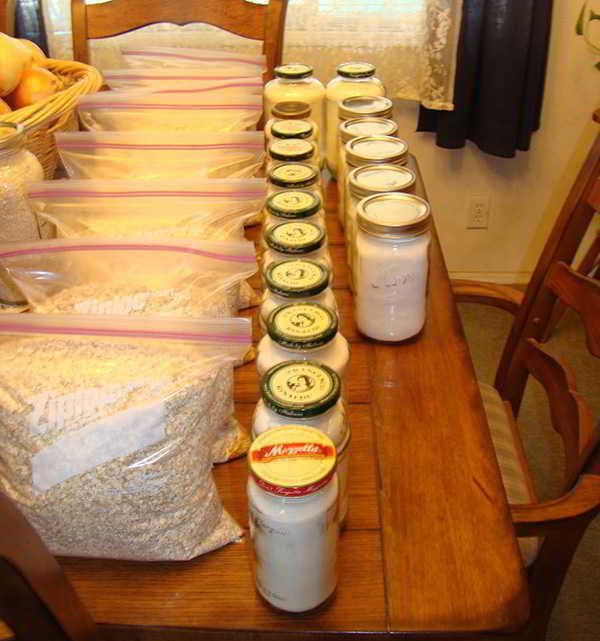 I use gallon and half-gallon milk cartons to store flour, rice, cornmeal, oatmeal, beans, whey milk salt, sugar,etc. Wash and dry well. Drop a 5 Gram Silica Moisture Absorbent pack and a 300 CC Oxygen Absorbent pack into the carton before filling it. The Oxygen Absorbent pack draws the oxygen out and prevents any “critters” in carton’s contents from surviving and replicating. The Moisture Absorbent pack absorbs the moisture and prevents deterioration of the contents. Fill the cartons as full as possible, shaking occasionally to settle the contents. Screw the cap back on securely. In about 30 to 60 minutes, the sides of the milk cartons should cave slightly inwards showing a good seal. If not, put the contents into another carton with the packets in the bottom and discard the old carton. To store them, put rows down over your storage area, cover the rows with thin paneling, lay another row, cover with thin paneling, etc. You should be able to store stable rows up to about six feet high. I alternate my stored contents on every level so that I always have some of each readily available. Opps..was trying to reply to the sock over the jar idea. One comment on the article….the cost of the jars. New quart jars are about $10-$15 a dozen. Other storage options might be advised to keep costs down. That popcorn can be ground into flour and popcorn is organic! Love your thoughts, and all the comments about this article on how to can and save and pack the items purchased. I just have one problem. The total amount for the money spent is $104.84 based on amounts given, not the $82.83 stated. A little disheartening in my humble opinion. What an amazing thread. I am commenting just to say thank you to the author and all that contributed.. and to keep up on followup comments! Since the full date isn’t listed.. 2/19/2019. Thank you, Pinterest!